Nerf has announced they will release 2 new guns from the Doomlands series that will have clear plastic coverings so you can see the firing mechanisms. The Vagabond is a shotgun styled weapon with a rotating barrel that holds 6 darts and a pump-action reloading mechanism (top one in the pic). It will cost 25 US dollars. 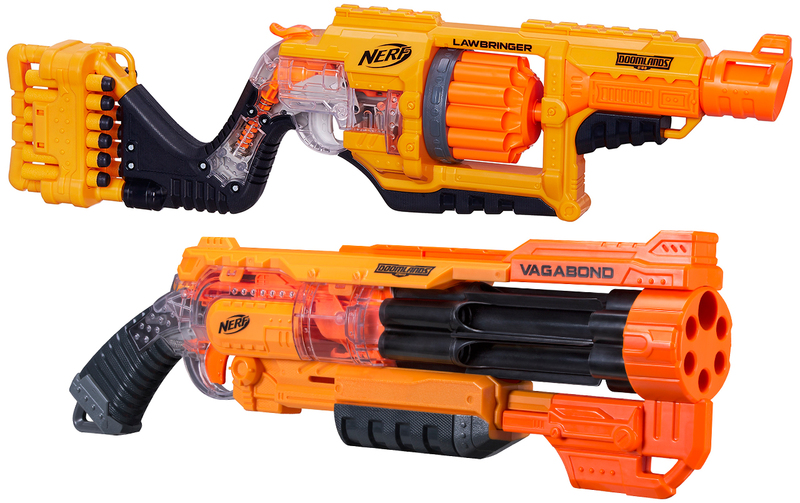 The Lawbringer blaster has a rotating 12 darts barrel and it works more as a giant revolver (bottom one in the pic). It will be sold for 35 US dollars. They will be available exclusively on August 1st on Target. This entry was posted in IT & Gadgets and tagged nerf, toys by projectundergeek. Bookmark the permalink.